When you post your syllabus and publish your course in Canvas, your syllabus will become available in the Yale's Course Search. It may take up to 4 hours for your syllabus to appear in the system. By Default, you are given 1 Gig of space within your Canvas course. For any reason you feel you need more space, please email canvas@yale.edu and we are happy to assist you. 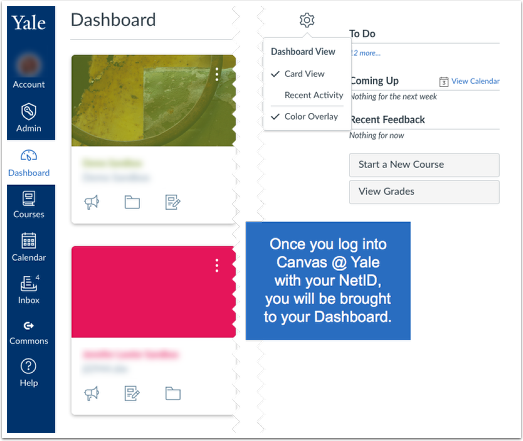 After logging on with your Yale NetID, you will see colored cards for each of your upcoming classes. Click a card to access the course site. If any of your courses does not appear in Canvas, the class might not be set up in the Registrar’s Banner system with you as a listed instructor. Please contact your local registrar for assistance. 1. Click Syllabus on your Course Menu. 2. To edit your syllabus, click “Edit” on the right-hand side. Note: Any assignments within your course will be automatically populated underneath your course syllabus. 3. You can then type your syllabus within the text editor. 4. To upload your syllabus (or to link to other documents), you can find those documents within the Files menu on the right-hand side. If you have documents you’d like to share with students in the class, you can upload them easily in Files, which is similar to Classes*v2 Resources in many ways. In Canvas, Files is primarily designed to be a behind-the-scenes repository, rather than the primary way of sharing materials directly with students. Consider structuring students’ engagement with uploaded files by creating a “Page” that contains links to the files as well as descriptive text to provide some context to the files. 1. Select Files from your Course Menu. 2. Option 1: Click upload and select files from your computer. 3. Option 2: Click and drag files from your computer to the folder area. Note: If you have zip files (including from Classes*v2), you can click and drag these folders into the folder area and Canvas will expand the zip file automatically. 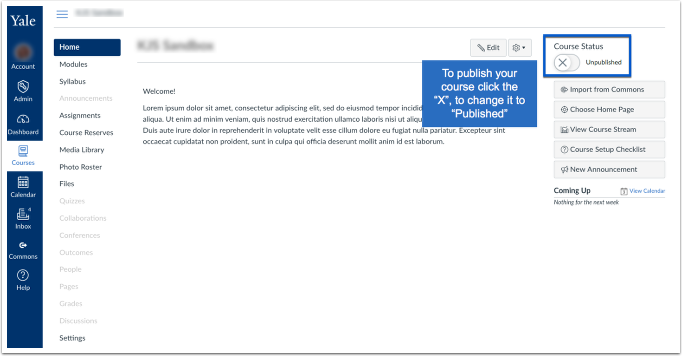 On the Home page of your course site, simply click the “Publish” button to make your course visible to students who will be “shopping” your course or who have officially enrolled. There’s a lot more you can do with Canvas beside just sharing a syllabus and files!